You do remember to click save at the bottom of the page? That strange, I recommend that you enable debugging and check your phplist and Apache logs for errors. Treat me like I’m 6. 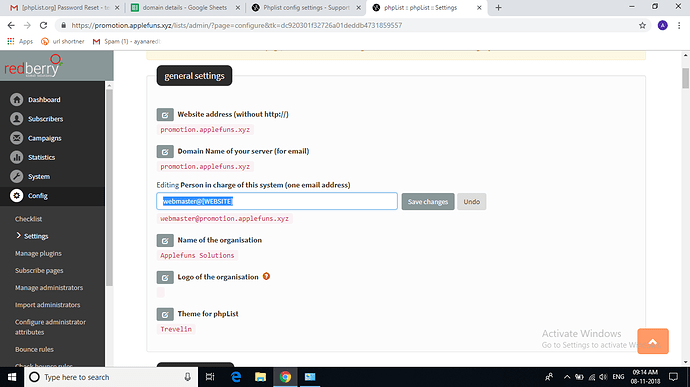 Can you make changes to any attributes in the section? Have you been able to change these attributes before, and now you can’t? Try to give the list a “feel” for what’s happened/changed with the site/app/code. Maybe the email address change might fail due to email validation check. Eg: your top level domain is not whitelisted on phpList: xheni@test.xheni would fail. @xheni Do you any recent PRs relate to this apparent issue? @samtuke yes, there is an open PR for this.